A computer thinks by loading computer instructions into the processor and executing them. Once the processor has finished executing one instruction, it loads the next instruction and executes it. Each instruction is loaded into the processor on each cycle of the clock. The computer operates like a machine by executing one instruction at a time as the clock line turns ON and OFF. The clock keeps everything in order. This illustration shows a simplified processor, with four data registers and a program counter. When the program counter increments, it moves the next program instruction into the the processor, then executes that current instruction. Every processor has an instruction set. The instructions set is made up of the instructions that the processor can execute. Each instruction does one specific thing such as adding two numbers together. 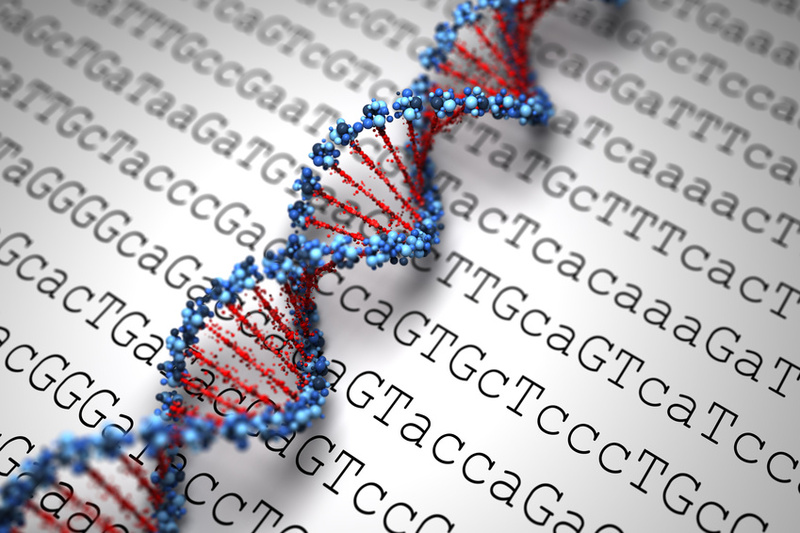 The instruction set is limited to instructions like adding, moving, or manipulating data. Each processor instruction does very little but in combination the instructions form a powerful programming language. 1. The computer program moves up. 2. A new instruction is loaded into the processor with each beat of the clock. 3. The instruction is executed. 4. The processor acts upon the data in its registers as dictated by the instruction. 5. Go to step one. While a computer is capable of fantastic things, during any one moment it is doing very little. It only executes one instruction at a time. Each computer instruction involves movement or manipulation of very little data. 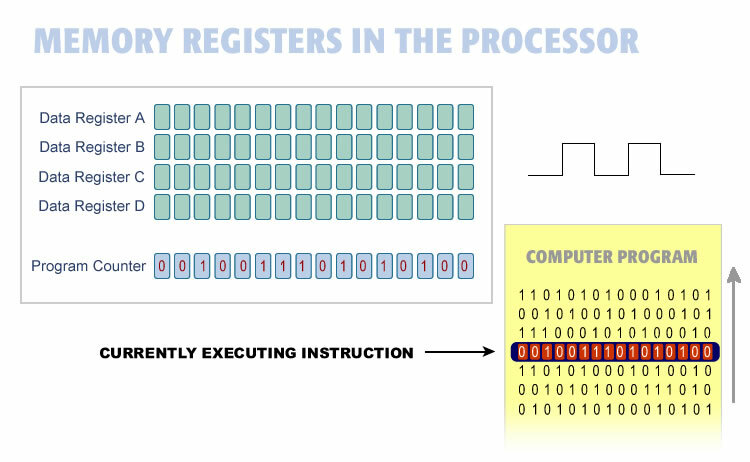 The processing takes place within the processor’s registers. The processor moves data from memory into its registers. However the actual manipulation of data takes place within the processor. 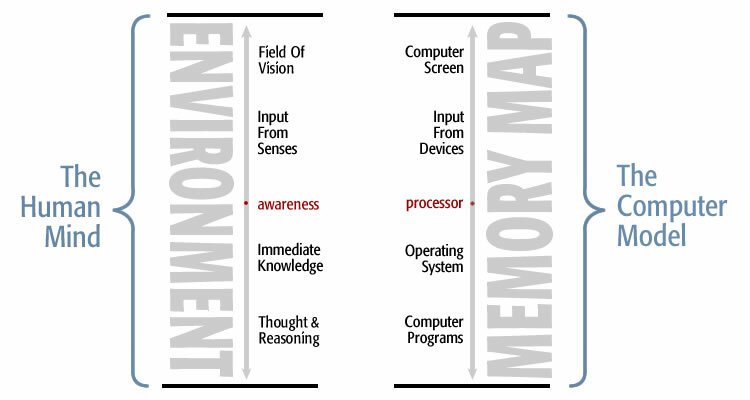 The movement or manipulation of data inside the processor represents processor awareness. Awareness is what is happening to data inside the processor. The processor is surrounded by memory. Data registers inside processors are memory too. The difference between general memory and data registers inside the processor is that data registers can be operated on and are under the direct control of the processor. As a programmer you must learn to read your program. Imagine you have completed programming for the day. Then you come back the next day. You open your program and read it. You read your program by putting yourself in the perspective of the processor. In other words, you start at the top of the program, with the first line, and mentally execute it. Then you go to the next line, exactly like the processor would do. Then you mentally execute that line. Then you go to the third line, and so on. If you are a good programmer and if your program is well written, you can follow the logic (the processor’s path) from the first line to the last line, mentally interpreting each line as you go. If you can do that you know exactly what the program does. Shown below is a sample computer program. Open your program and look at the first line. That is your initial point of focus. Like the processor, take in one line and mentally execute it to find out what it will do. The entire program may be thousands of lines long, but your focus at this moment is on the first line. You read a program by moving that point of focus down the page one line at a time. The red lines show how the processor moves from line to line through a computer program. At times during the program you may enter a loop as shown above. During this time your point of focus starts at the first line of the loop. You mentally execute each line of the loop and then jump back to the top of the loop, as the processor would do. In the example above the program is reading email addresses from a database and printing the results to a table on the screen. Your point of focus may jump around physically in the program. 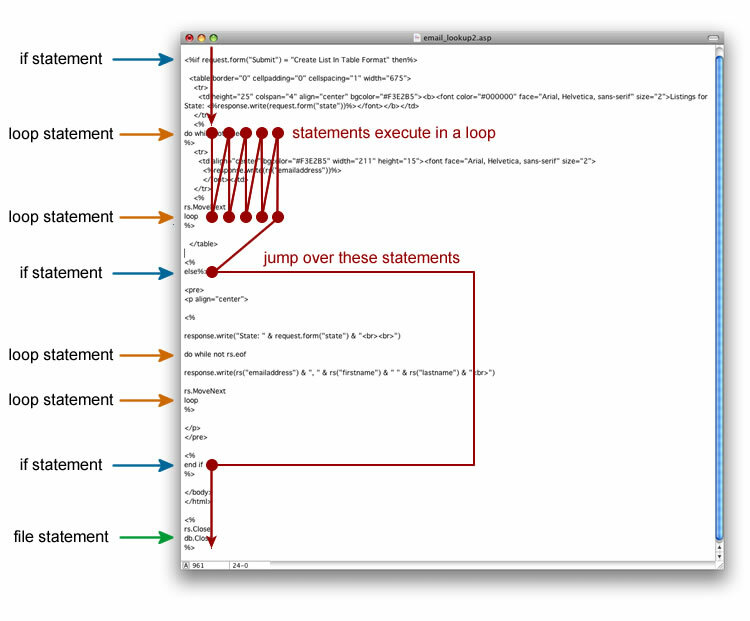 Program execution jumps several lines after encountering an if statement. However the logic – the processor path through the program – remains the same. You mentally execute one instruction at a time from the first line of the program to the last. Our awareness operates like the focus within this program. Like the red line moving through the program, our awareness moves within the environment. Awareness acts like program execution within this program. Awareness, like program execution, is only at one place at a time. Thought is characterized by the movement of data through the processor. Thinking involves data and time. At no time when reading a computer program do you mentally execute two instructions at once. Program execution happens sequentially. You look at one instruction and figure it out. Then you look at the next instruction and figure that out. This is how the awareness works. You focus on one thing and acknowledge it. Then you focus on the next thing and acknowledge that. As the processor interprets each instruction of a program sequentially, awareness acknowledges one thing sequentially. Awareness within the environment works like focus within a program. That is why thinking is called a line of thought and awareness is called a point of view. 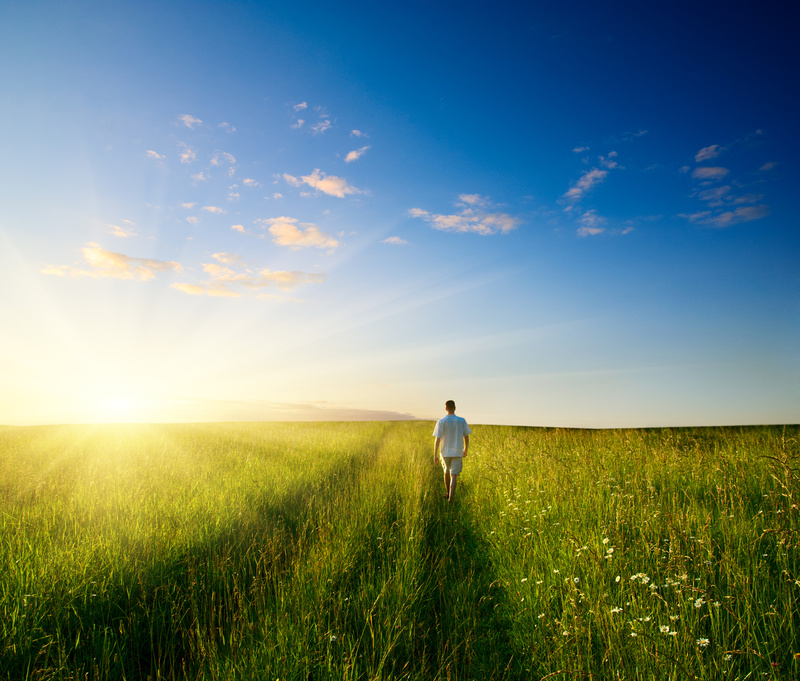 The human mind absorbs the physical environment as we move through life. This is our memory. The physical environment is made up of visual, sound, and other sensory stimuli, as well as any thought going on. The present moment is like the memory space of a computer. The environment, with its length, width, and depth of the moment, is mapped into memory. As each moment passes this memory map of the moment is be absorbed into memory. The outside world is our memory of the physical world. The Human Mind and The Computer Model are similar. Both are based on memory. Both have a processor that acts as the center of the universe. Both include everything that is going on at the moment. Our awareness is like the processor. Our environment is like the ransom access memory surrounding the processor. Our memory is like random access memory (RAM) containing everything going on inside the computer at that moment. Computers have an internal clock or clock line. The internal clock sets a cadence for the computer by turning off and on. Inside a computer time is not continuous. Time is made up of beats or pulses. Instructions of a computer program are executed only when the clock line is ON. 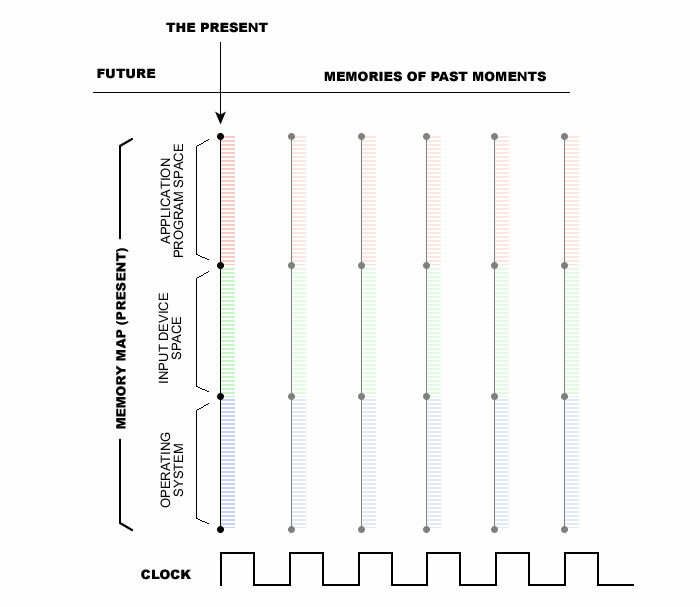 The illustration above shows how the entire memory map of a computer could be read into memory each time the clock line turns ON. The entire memory map is being read onto long term memory on each beat of the clock. A system like this could save all realities from the beginning of time to the present. With a system like this there is nothing that is outside this cumulative memory space.